Globe-trotting doesn’t require an airplane ticket, not if you check your local convention options and find an International Festival to visit like I did this past weekend. Most festival-goers had their sights set on culinary treats, crafts, music and dance performances from around the world. My focus was meeting festival presenters who attended elementary school in countries other than the United States. American teachers’ observations about trends in education and my own experience working with thousands of K – 5 kids in the US are the foundation of my blog. But, world news suggests that catching and keeping students’ attention is a growing challenge in many developed nations. So, it makes sense to learn about and share strategies that teachers use in countries like Turkey – featured country in this blog – the first in my International Festival of Attention-Grabbers series. Passport ready? It’s time to visit Turkey! It's time to travel the world! GIVE A CALENDAR QUIZ – Dr. Ozturk, a delightful dark-haired woman with quick brown eyes, clearly remembers her second and third grade teacher, Mr. Bozturk in Istanbul, Turkey. When she was an elementary school girl in the 1960’s, Mr. Bozturk began each school day with a barrage of questions that he shot out when he first entered the classroom. Mr. Bozturk’s Calendar Quiz sent an unmistakable message…it’s time to learn! Dr. Ozturk likes to point out that in addition to “bringing the students into the present to begin the school day,” Mr. Bozturk’s Calendar Quiz also served as a math lesson with the inclusion of students counting numbers. “When I was a student in Turkey,” Dr. Ozturk recalls, ” hearing your name called while simultaneously being told to be quiet was considered to be humiliating.” “Teachers were strict; that was accepted practice.” “But,” she muses, “because of Mr. Bozturk’s strictness, I learned a lot and went on to become an electrical engineer and university professor.” Dr. Ozturk says that she’s been waiting a long time to tell the story of the remarkable Mr. Bozturk and his effective attention-getting quiz! 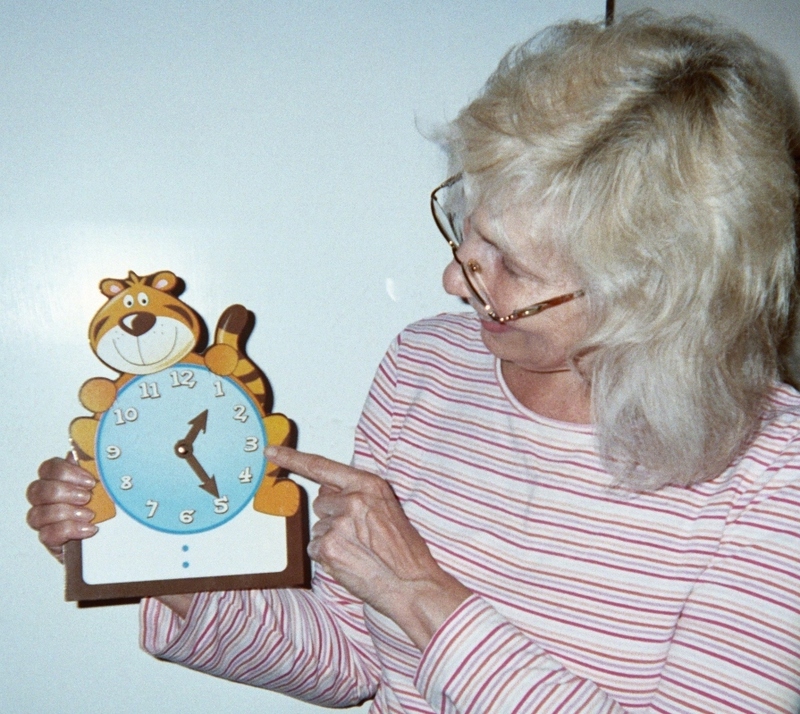 MAKE UP A TIME QUIZ FOR YOUR CLASS – Glance back at my blog pic above and you’ll see a simple cardboard clock with moveable hands – a common tool to help children learn how to tell time. Why not also add a clock to your bag of attention-ology tools and tricks? You can use a clock in a time quiz to do as Mr. Bozturk did, bring your students into the present at the beginning of the school day. When you hold up the clock like I’m doing in my blog pic, you’ll create a focal point for your kids’ attention. Clock in hand in front of your class, fire off questions related to time and date until you have all students’ eyes on you, ready for your first lesson. One day Hodja’s friends handed him a saz, a stringed musical instrument like this one (hold yours up for the class to see), and asked him to play a song. Hodja was not musically inclined but nevertheless took the instrument in his hands, placed his index finger on one of the frets and started strumming. “Is that how you play the saz?” complained his friends. Saz players play different notes by moving their fingers up and down the neck. You are playing a single note! Finding and sharing effective resources to help students stay on task and become well-educated citizens of the world – that’s a goal of Attention-ology for K – 5 Teachers.